I'm so happy to share with you my newest release, Sailboats at Hanalei. 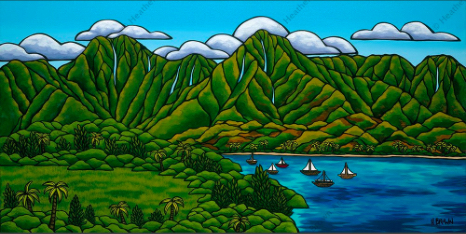 There are so many magical views of Hanalei Bay on Kauai's North Shore, I just could't resist this summer time vision of one of the most beautiful places on Earth. What do you think? You can now order a limited edition giclee on canvas, a Hand Highlighted Artist Proof on Canvas and even some matted prints to bring the outer island beauty into your home. Ask for it from your favorite Heather Brown Art shop or check it out on my website here: Heather Brown Art. Have a GREAT weekend and Mahalo nui loa for all of your support and Aloha!